Estrella Moreno, center, winner of the Teens Make a Difference “Top Dawg” award, with, from left, Gwen Rodgers of the San Bernardino City Unified School District board; Doug Rowand, president and chief executive officer of Arrowhead United Way; San Bernardino Mayor Carey Davis; and Carolyn Tillman, representing Ted Alejandre, county superintendent of schools. 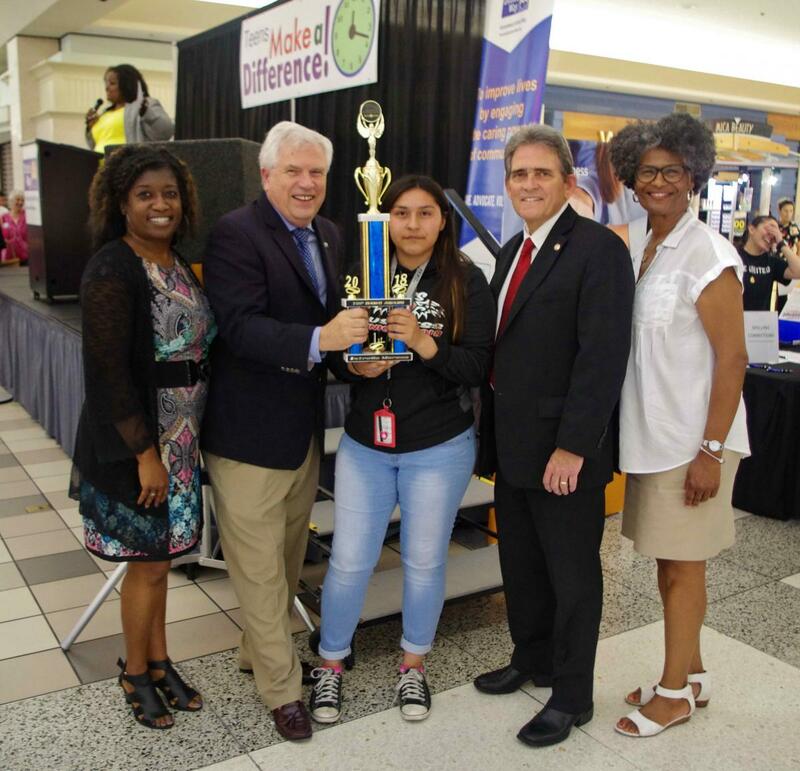 Estrella Moreno, a student at San Bernardino High School, won the “Top Dawg” award at the 25th annual Teens Make a Difference awards ceremony held May 10 at Inland Center Mall in San Bernardino. The ceremony recognized high school students for their volunteer service at places such as libraries, hospitals, schools, nonprofits and community-based organizations. Estrella was honored for volunteering 965 hours through Dignity Health at St. Bernardine Medical Center, at the Family Focus Center where she assisted with daily routines, special-event projects and monitoring youth who attended the after school-program. The ceremony acknowledged nearly 64,500 hours of volunteer service by 1,404 students from 13 high schools in the past year. Those who had volunteered 25 hours or more received awards and goodie bags filled with things donated by Arrowhead and Inland Empire United Way and Inland Center stores. The Top School Award went to Rialto High School for more than 17,400 hours volunteered by more than 490 students. Honorable Mentions for more than 500 volunteers hours went to Kashmaila Ali and Benjamin Hiller of Cajon High School and Kimberly Leonardo of San Bernardino High School. Among those who helped present certificates to the students were San Bernardino Mayor Carey Davis; Carolyn Tillman, representing Ted Alejandre, San Bernardino County superintendent of schools; and Gwen Rodgers, vice president of the San Bernardino City Unified School District school board. Communities that have benefited from volunteer hours performed by the students are Colton, Grand Terrace, Highland, Loma Linda, Redlands, Rialto, San Bernardino and Yucaipa. a Difference awards program began in 1993, the annual ceremonies have recognized 15,592 volunteers completing more than 1.3 million hours of service, according to a press release. Teens Make a Difference is a program of Inland Center Mall, Arrowhead United Way’s Volunteers United program and Inland Empire United Way’s Volunteer Initiative, ieVolunteers. For information, call Inland Center Mall at 909-884-7268. © 2019 Arrowhead United Way.